Fawcett, J. W. & Asher, R. A. The glial scar and central nervous system repair. Brain Res. Bull. 49, 77–391 (1999). Alizadeh, A., Dyck, S. M. & Kataria, H. Neuregulin-1 positively modulates glial response and improves neurological recovery following traumatic spinal cord injury. GLIA 65, 1152–1175 (2017). Wu, X. et al. RhoA/Rho Kinase mediates neuronal death through regulating cPLA2 activation. Mol. Neurobiol. 54, 6885–6895 (2017). Liu, G. et al. FK506 attenuates the inflammation in rat spinal cord injury by inhibiting the activation of NF-kappa B in microglia cells. Cell Mol. Neurobiol. 37, 843–855 (2017). Shao, A. et al. Hydrogen-rich saline attenuated subarachnoid hemorrhage-induced early brain injury in rats by suppressing inflammatory response: possible involvement of NF-kappa B pathway and NLRP3 inflammasome. Mol. Neurobiol. 53, 3462–3476 (2016). Zhong, L. et al. Quantitative proteomics study of the neuroprotective effects of B12 on hydrogen peroxide-induced apoptosis in SH-SY5Y cells. Sci. Rep.-UK 6, 22635 (2016). D L Rivas, J. & Fontanillo, C. Protein-protein interactions essentials: key concepts to building and analyzing interactome networks. PLoSComput. Biol. 6, e1000807 (2010). Han, P., Gopalakrishnan, C., Yu, H. & Wang, E. Gene regulatory network rewiring in the immune cells associated with cancer. Genes 2017(8), 308, https://doi.org/10.3390/genes8110308 (2017). 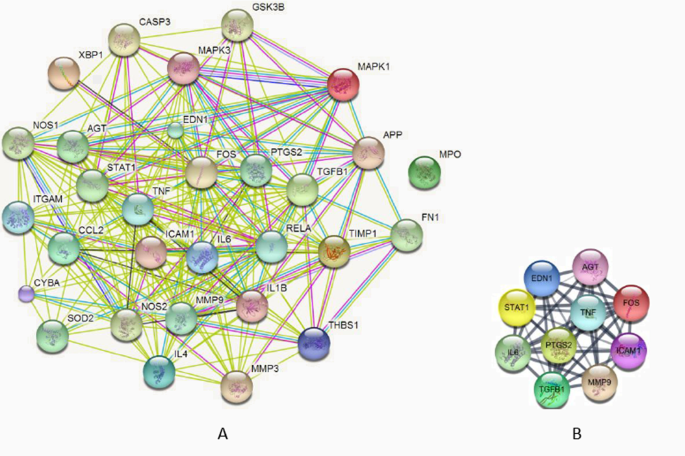 McGee, S. R., Tibiche, C., Mark Trifiro, M. & Wang, E. Network analysis reveals a signaling regulatory loop in PIK3CA-mutated breast cancer predicting survival outcome. Genomics Proteomics & Bioinformatics 15, 121–129 (2017). Wang, E. et al. Predictive genomics: A cancer hallmark network framework for predicting tumor clinical phenotypes using genome sequencing data. Semin. Cancer Biol. 30, 4–12 (2015). Wang, E. Understanding genomic alterations in cancer genomes using an integrative network approach. Cancer Lett. 340, 261–269 (2013). Singh, S. & Li, S. S. Phthalates: toxicogenomics and inferred human diseases. Genomics 97, 148–157 (2011). Lin, Y. C., Wang, C. C. & Tung, C. W. An in silicotoxicogenomics approach for inferring potential diseases associated with maleic acid. Chem. Biol. Interact. 223, 38–44 (2014). Amberger, J. S., Bocchini, C. A., Schiettecatte, F., Scott, A. F. & Hamosh, A. OMIM.org: Online Mendelian Inheritance in Man (OMIM®), an online catalog of human genes and genetic disorders. Nucleic Acids Res. 43(Database issue), D789–798 (2015). Kanehisa, M. et al. KEGG for linking genomes to life and the environment. Nucleic Acids Res. 36, D480–484 (2008). Szklarczyk, D. et al. STRING v10: protein-protein interaction networks, integrated over the tree of life. Nucleic Acids Res. 43(Database issue), D447–452 (2015). STRING database homepage, https://string-db.org/ (2017). Davis, A. P., Wiegers, T. C., Rosenstein, M. C. & Mattingly, C. J. MEDIC: a practical disease vocabulary used at the Comparative Toxicogenomics Database. Database 2012, 1–9 (2012). Article ID bar065. Davis, A. P. et al. The comparative toxicogenomics database: update 2013. Nucleic Acids Res. 41, D1104–1114 (2013). Comparative Toxicogenomics Database homepage, http://ctdbase.org/ (2017). National Center for Biotechnology Information homepage. https://www.ncbi.nlm.nih.gov (2018). Kolb, W. P. & Granger, G. A. Lymphocyte in vitro cytotoxicity: characterization of human lymphotoxin. Proc. Natl. Acad. Sci. USA 61(4), 1250–1255 (1968). Subramanian, A. et al. Gene set enrichment analysis: A knowledge-based approach for interpreting genome-wide expression profiles. PNAS 102, 15545–15550 (2005). Pathan, M. et al. Funrich: An open access standalone functional enrichment and interaction network analysis tool. Proteomics 15, 2597–601 (2015). Shannon, P., Markiel, A. & Ozier, O. Cytoscape: A Software environment for integrated models of biomolecular interaction networks. Genome Res. 13, 2498–2504 (2003). Doncheva, N. T., Assenov, Y., Domingues, F. S. & Albrecht, M. Topological analysis and interactive visualization of biological networks and protein structures. Nat. Protoc. 7, 670–685 (2012). Tung, C. W. PupDB: a database of pupylated proteins. BMC Bioinformatics 13, 40 (2012). Maere, S., Heymans, K. & Kuiper, M. BiNGO: a Cytoscape plugin to assess over representation of Gene Ontology categories in biological networks. Bioinformatics 21, (3448–3449 (2005). Croft, D. et al. Reactome: a database of reactions, pathways and biological processes. Nucleic Acids Res. 39, D691–697 (2011). Coletti, M. H. & Bleich, H. L. Medical subject headings used to search the biomedical literature. J. Am. Med. Inform. Assoc. 8, 317–323 (2001). Assenov, Y., Ramirez, F., Schelhorn, S. E., Lengauer, T. & Albrecht, M. Computing topological parameters of biological networks. Bioinformatics 24, 282–284 (2008). Zotenko, E., Mestre, J., O’Leary, D. P. & Przytycka, T. M. Why do hubs in the yeast protein interaction network tend to be essential: reexamining the connection between the network topology and essentiality. Plos Comput. Biol. 4, e1000140 (2008). Cohen, R. & Havlin, S. Scale-free networks are ultrasmall. Phys. Rev. Lett. 90, 058701 (2003). Kulp, A. & Kuehn, M. J. Biological functions and biogenesis of secreted bacterial outer membrane vesicles. Annu. Rev. Microbiol. 64, 163–184 (2010). Zarifkar, A. et al. Agmatine prevents LPS-induced spatial memory impairment and hippocampal apoptosis. Eur. J. Pharmacol. 634, 84–88 (2010). Hauss-Wegrzyniak, B., Lynch, M. A., Vraniak, P. D. & Wenk, G. L. Chronic brain inflammation results in cell loss in the entorhinal cortex and impaired LTP in perforant path-granule cell synapses. Exp. Neurol. 176, 336–341 (2002). Zoraghi, R. & Reiner, N. E. Protein interaction networks as starting points to identify novel antimicrobial drug targets. Curr.Opin.Microbiol. 16, 566–572 (2013). Pagni, C. A. & Zenga., F. Posttraumatic epilepsy with special emphasis on prophylaxis and prevention. ActaNeurochir.Supplementum 93, 27–34 (2005). Garga, N. & Lowenstein, D. H. Posttraumatic Epilepsy: A Major problem in desperate need of major advances. Epilepsy Curr. 6, 1–5 (2006). Pitkänen, A., Kharatishvili, I. & Karhunen, H. Epileptogenesis in experimental models. Epilepsia 48(Supplement 2), 13–20 (2007). Clancy, R. R., Sladky, J. T. & Rorke, L. B. Hypoxic-ischemic spinal cord injury following perinatal asphyxia. Ann. Neurol. 25, 185–189 (1989). De Louw, A. J. A. et al. Apoptosis in the rat spinal cord during postnatal development; the effect of perinatal asphyxia on programmed cell death. Neuroscience 112, 751–758 (2002). Abematsu, M. et al. Neurons derived from transplanted neural stem cells restore disrupted neuronal circuitry in a mouse model of spinal cord injury. J. Clin. Invest. 120, 3255–3266 (2010). Amberger, J., Bocchini, C. & Hamosh, A. A new face and new challenges for Online Mendelian Inheritance in Man (OMIM®). Hum. Mutat. 32, 564–567 (2011). Sun, K., Goncalves, J. P., Larminie, C. & Pržulj, N. Predicting disease associations via biological network analysis. BMC Bioinformatics 15, 304, http://www.biomedcentral.com/1471-2105/15/304 (2014). Zhang, L. et al. Microenvironment-induced PTEN loss by exosomal microRNA primes brain metastasis outgrowth. Nature 527, 100–104 (2015). Zhao, D. et al. Synthetic essentiality of chromatin remodelling factor CHD1 in PTEN-deficient cancer. Nature 542, 484–488 (2017). Kuchay, S. et al. PTEN counteracts FBXL2 to promote IP3R3- and Ca(2+)-mediated apoptosis limiting tumour growth. Nature 546, 554–558 (2017). Chen, K. et al. RNA-Seq characterization of spinal cord injury transcriptome in acute/subacute phases: a resource for understanding the pathology at the systems level. Plos One 8, e72567, https://doi.org/10.1371/journal.pone.0072567 (2013). Salomon, B. L. et al. Tumor Necrosis Factor α and Regulatory T Cells in Oncoimmunology. Front. Immunol. 9, 444, https://doi.org/10.3389/fimmu.2018.00444 (2018). Barger, S. W. et al. Tumor necrosis factors alpha and beta protect neurons against amyloid beta-peptide toxicity: evidence for involvement of a kappa B-binding factor and attenuation of peroxide and Ca2+ accumulation. Proc. Natl. Acad. Sci. USA 92, 9328–9332 (1995). Mattson, M. P. & Meffert, M. K. Roles for NF-κB in nerve cell survival, plasticity, and disease. Cell Death Differ. 13, 852–860 (2006).